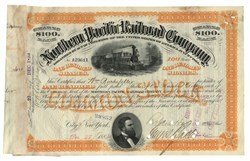 Northern Pacific RR Stock Issued To And Signed By William Rockefeller 1884, New York. Stock certificate for 100 shares. Orange Black. Engraved vignette of a steam locomotive at top center, nice portrait vignette of Frederick Billings at bottom. Issued to and signed on verso by William Rockefeller, Jr. (1841-1922) American financier, was a co-founder with his older brother John D. Rockefeller of the prominent United States Rockefeller family. He was the son of William Avery Rockefeller, Sr. and Eliza (Davison) Rockefeller. Punch and stamp cancellations not affecting Rockefeller's signature. Very Fine.